Andrea Beaman is frequently featured in a variety of respected media outlets as a celebrity chef, natural foods expert, and passionate holistic health advocate. In addition to hosting the award nominated, Fed Up! and Wise Up!, she currently co-hosts the Healthy View with Michelle Pfennighaus and Lisa Lewtan. Tune in weekly for simple tips and strategies in all areas of healthy living, including food, exercise, relationships, stress, fun, and spirituality. Andrea and her co-host’s deal with everyday women’s struggles and how to overcome them. Are you a confused by all the healthy hype in the media? Join the club! For 52 episodes, holistic health coach and natural foods chef Andrea Beaman came to the rescue of ordinary people whose culinary habits were putting their health at risk. For 13 episodes, Andrea traveled across the country seeking life-enhancing activities, and energizing, alternative therapies, and organic foods. Cinnamon Toxins Learn the best type of cinnamon to use and how it can benefit your body. In The Kitchen: Super Bowl Snacks With Andrea Beaman Top Chef contestant and holistic chef Andrea Beaman stopped by CBS 2 with some healthy Super Bowl snack ideas. Unhealthy Health Foods Thought you were eating something good for your health? Think again! There are many “unhealthy” health foods on the market that you need to be aware of. Honey is Sweet Allergy Relief Do you suffer from seasonal allergies? Try a little local raw honey for some sweet relief. Lifestyle Magazine, Andrea discusses lifestyle changes to heal auto-immune diseases. “We Owe What? The Anderson-Battiste Family,” The Live Well Network. Andrea mentors holistic health coach Ann Anderson, encouraging her to believe in herself and her work. Taste of Summer, News 8, “Connecticut Style.” Want to know how to beat the heat and keep cool this summer? Try this simple Marinated Chickpea Salad. What You Should Eat, Fox News CT. Interview and recipe: Summer Quinoa with Mint Dressing. Cancer Answers TV Join Andrea and Dr. Judy Seeger as we get to the root cause of cancer and how to heal it. Eliminating Candida Overgrowth: Andrea joins Lillian McDermott on her radio show to discuss Candida overgrowth and the simple ways to rebalance your body to get the candida to go back into the large intestine where it can do it’s best work! Lillian McDermott Radio Show There is medicine in your kitchen! Andrea joins Lillian McDermott to share easy and effective home remedies to heal what’s ailing you.. Delicious Recipes That Heal & Restore Our Bodies”. Understand how food can improve your health, what specific foods are needed for deficiency and how eating sustainable, local and organic foods will improve your overall health and vitality. The Functional Medicine Radio Show”. Do you think hyperthyroidism is untreatable? Think again! Listen in as Andrea and Dr. Carri discuss the many ways to naturally treat the thyroid and endocrine system. How to Nourish Your Lungs and Get Ready for Fall:”. Andrea joins Lillian McDermott’s radio show, When You Need A Friend, to discuss how to nourish the lungs and stay healthy during the fall flu, cold and allergy season. Lillian McDermott Radio Show “Taking a Deeper Look into Thyroid Disease”. Andrea and Lillian continue their discussion and delve deep into the potential causes of thyroid disease that people aren’t talking about. Andrea shares about the deeper truth connected with thyroid disease and how learning to express yourself healthfully supports the healing process. You’ll also discover how to implement daily changes to nurture your thyroid, and how beneficial a holistic approach is to healing your body and mind. Lillian McDermott Radio Show “Happy Healthy Thyroid”. Andrea talks with Lillian about what causes thyroid disease and how to heal your thyroid naturally. In this informative and lively interview you’ll discover various foods, herbs and lifestyle adjustments to help you heal your thyroid condition, too. Emeril Gets Healthy with Chef Andrea Beaman, Martha Stewart Radio Blog. We took the maxim of “you are what you eat” to heart and focused on the foods that bring good taste and good health to the table as Emeril sat down with holistic health coach, chef, teacher, author, and TV host Andrea Beaman. “I Eat Green with Bhavani,”Progressive Radio Network Podcast. Bhavani Jaroff, of iEat Green, interviews Andrea Beaman on living a more sustainable life. Radio MD – Andrea Beaman joins To Your Good Health Radio to discuss how some foods you think of as “healthy” can actually damage your body. Thyroid Interview on Savvy Central Radio Online @ Savvy Central Radio, Listen to Andrea and Christina talk about the many ways to heal thyroid and other illnesses. 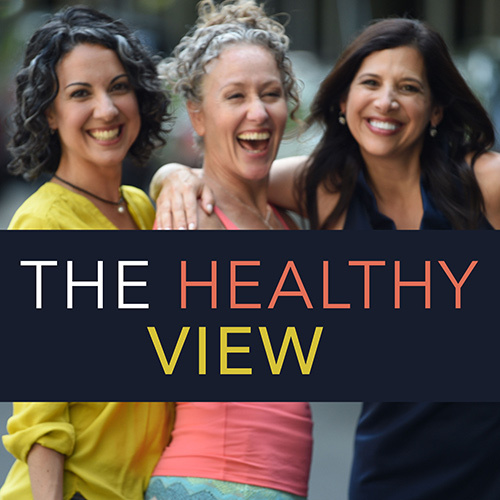 Media Opportunity For Health Coaches, Healthy View Radio focuses on real life women’s health struggles, hosted by three health and wellness rock stars: Andrea Beaman, Lisa Lewtan, and Michelle Pfennighaus – all of whom are expert health coaches with large email lists and social media followings. The show will be aired LIVE on Thursday afternoons and then immediately downloaded to an iTunes podcast. Self Magazine: 7 (Slimming) Cold Soups for Hot Summer Nights Summer is just getting started, which means there will be plenty of days and nights ahead when it is just too hot to cook. The solution? These delectable cold soups! Martha Stewart’s Whole Living Magazine: Foodie Fighter – Interview with Andrea Beaman Click on the magazine to view PDF article. Natural Awakenings: Washington, DC Metro: Reconnecting with your Body There are two main components to assess when addressing a client’s body. The physical appearance such as pallor, muscle mass, gender or even how their voice sounds to determine their bio-identical needs. The second and more importantly, their location to determine which foods they should be eating throughout the year.